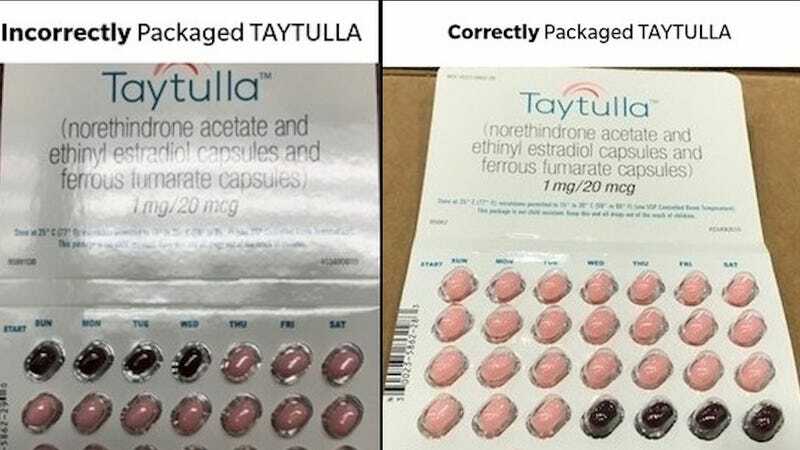 If you’re on the birth control pill Taytulla, check the serial numbers as soon as possible because the pharmaceutical company that makes it, Allergan, just announced that—uh—in a recent lot, some of the pills are actually misplaced placebos! Great! One lot of Taytulla physician sample packs (marked lot #5620706 Exp. May 2019) contained the out-of-order pills, the company said. It learned about the error from a doctor who reported it. There are approximately 170,000 units in the one lot of physician samples that Allergan voluntarily recalled, a company spokeswoman said. The sample packs of 28 pills each were distributed to doctors nationwide. The company told the Wall Street Journal that they haven’t received any reports of unintended pregnancies, which I’m sure is very reassuring to anybody resisting the urge to run home from work and double check their pack right now.